Our expectation had been for some time that Huntsman’s exit of its TiO2 business was an enabling move, in order to allow the remaining company to do something larger – not dissimilar to the moves made by Rockwood. We have highlighted HUN as one of the more interesting SMID names since the beginning of the year – including in research published today. Today’s announcement with Clariant shows the determination of the company to gain the scale needed to be a credible global competitor in the slow growth end-markets that have plagued the company for years. The combination is yet another large cross border US/Europe deal – the fourth proposed in the chemical space alone in last 18 months (Bayer/Monsanto, Praxair/Linde and PPG/Akzo). In every case one of the core drivers is top line growth – or lack thereof – and companies are chasing mergers to gain synergies and scale – both in terms of customer exposure and R&D. Geographic diversity is also a driver in part because of portfolio risk management but also because customers are increasingly looking for global solutions. While the deal synergies and the scale are likely to get initial attention – good for both stocks – the risk to this story is complexity – how the companies report once combined and how easy it will be for investors to understand the key drivers. Clariant reports in 4 segments and Huntsman (post the Venator spin) reports in three. Both platforms are geographically diverse. The combined company does not want to fall into the Eastman or GE trap, where either the company does not provide enough data to help investors model or becomes too complex to manage effectively. Investors in both companies, if they wish to remain involved, should lobby immediately for clarity in reporting and ample disclosure. 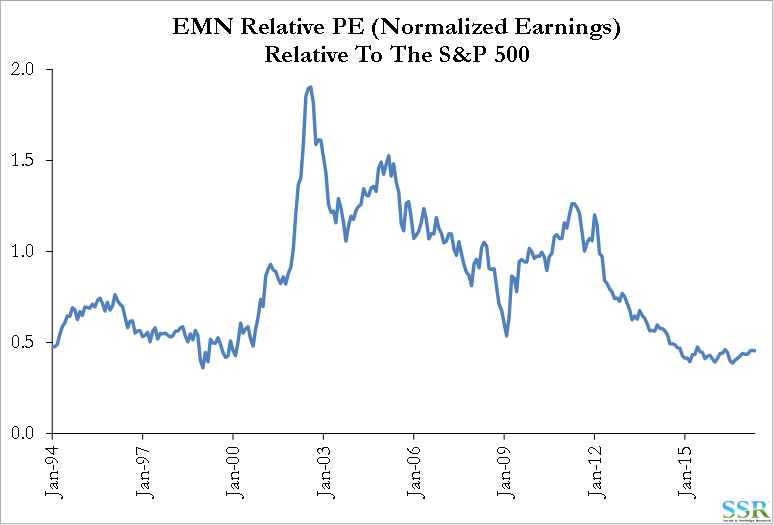 EMN’s relative PE is a great example of what can happen when a complex portfolio is not adequately described in earnings reports and presentations – Exhibit 1. ©2017, SSR LLC, 225 High Ridge Road, Stamford, CT 06905. All rights reserved. The information contained in this report has been obtained from sources believed to be reliable, and its accuracy and completeness is not guaranteed. No representation or warranty, express or implied, is made as to the fairness, accuracy, completeness or correctness of the information and opinions contained herein. The views and other information provided are subject to change without notice. This report is issued without regard to the specific investment objectives, financial situation or particular needs of any specific recipient and is not construed as a solicitation or an offer to buy or sell any securities or related financial instruments. Past performance is not necessarily a guide to future results.